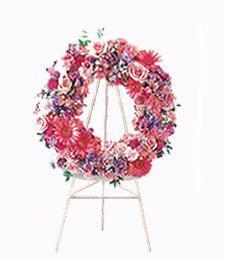 Add that special touch to that delicate occasion with a plethora of ravishing red and shimmering white blossoms to symbolize all those Candy-Striped Memories. 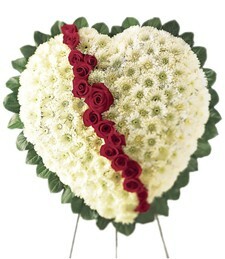 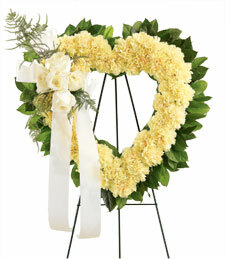 Bring them memories of bright cheer and that scared love will last forever. 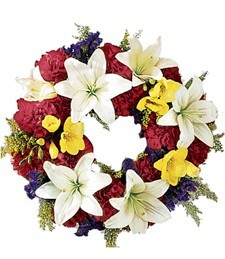 This beautiful casket wreath, adorned with bright and colorful lilies, is a wonderful way to extend your support and sympathy to the grieving family of a departed friend or loved one. 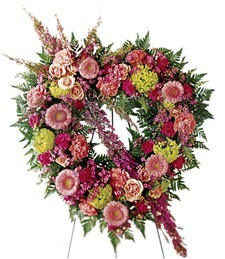 Arranged with glorious color and refreshing splendor, this lovely wreath of exquisite flowers exemplifies the heights of loving tribute and honor. 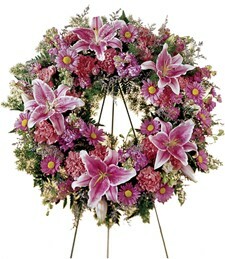 The most magnificent of souls deserve the most magnificent displays. 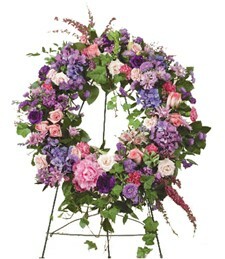 So shower that grieving loved one with a token of surest affections with delicate blooms in shades of pastel purple, pink, blue, and cream. 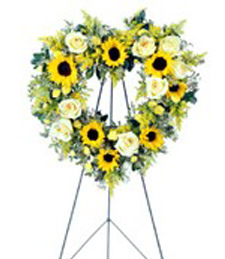 This elegant wreath, adorned with yellow sunflowers and roses of white and cream, is a beautiful and heart-felt way to say good-bye to a cherished friend or loved one. 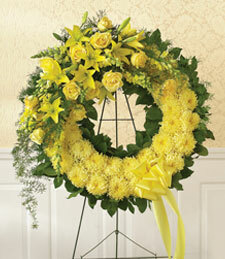 Honor their memory and extend your support to their grieving family with this gorgeous medley. 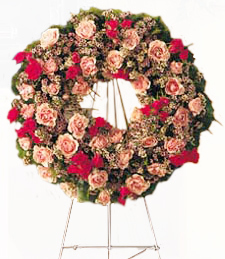 Rich, rosy hued carnations and warm pink roses wound together on this wonderful wreath illustrate your deep respect for the dearly departed's nurturing nature. 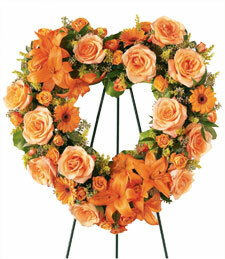 During these trying times, bring a little joy to a grieving friend or loved one with this stunning assortment of vibrant, multi-colored roses. 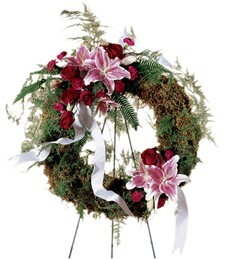 A beautiful wreath adorned with bright and cheerful lilies and daisies, this arrangement is a heart-felt and loving way to bring a little joy and harmony to a grieving friend or loved one. 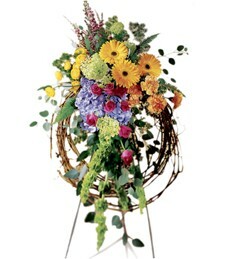 When a dear friend or loved one passes away, extend your sympathy and support to their family with this beautiful standing arrangement filled with multi-colored, vibrant flowers. 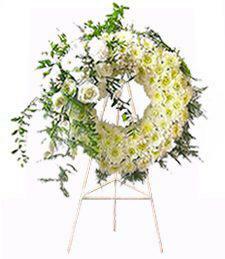 Generous bunches of gerber daisies, pretty pastel roses and asters adorn an arrangement that truly reflects the enthusiasim and charisma of the cherished departed. 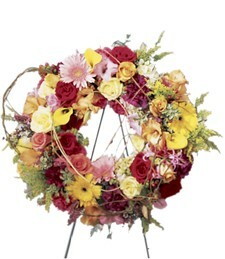 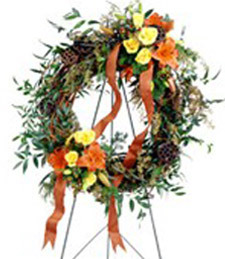 This warm wreath celebrates the delightful disposition that brightened your days.